Vivarin Reviews - Is It a Good Idea to Take This Caffeine Tablet? With 200 mg of caffeine per dose, Vivarin delivers a boost of alertness when you need it, at a lower per-dose price than coffee, and without the sugar or other added ingredients in energy drinks. Vivarin is an alertness aid that delivers about as much caffeine as a cup of coffee, so you’ll have the mental energy you need to power through your day. Compared to coffee (and even energy drinks), though, the supplement costs less than a quarter per tablet, and you also won’t have to worry about consuming sugar—which can quickly lead to a crash, or excess calories or strange ingredients. Whether you’re a professional managing your success, busy parent, college student, shift worker, or fitness fanatic (or all of the above), is it a good idea to take caffeine tablets? And if so, does Vivarin necessarily represent the best bang-for-your-buck? These are the two core questions we’ll help you explore in this article, starting with the fundamentals. How Does the Caffeine in Supplements Like Vivarin Affect the Body? Writing for Examine.com, Chad Zow explains that caffeine is the most widely used psychoactive substance in the world, since it provides the body with a temporary jolt of wakefulness. But, exactly how does it accomplish this? Without going into unnecessary detail, caffeine works by blocking the chemical adenosine from attaching to the A1 receptor in the brain, which is responsible for relaxing muscles and making you feel sleepy. To a lesser extent, caffeine also binds to A2A receptors and causes your body to release feel-good chemicals like dopamine and glutamate. 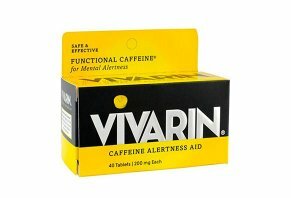 Is there a difference between the caffeine found in a dietary supplement like Vivarin, and what’s contained in coffee? In short, not really. In fact, most of the caffeine used in tablets is harvested during the commercial decaffeination process of coffee, and then repurposed. There is a difference, however, in the amount of caffeine contained in a dose of Vivarin (200 mg per tablet), and what’s found in a cup of coffee, which the USDA reports can be anywhere between 95 and 212 mg, depending on how the grounds are brewed. Chad goes on to explain that the number of caffeine molecules blocking A1 and A2A receptors peaks after about two hours (regardless of the source), and then slowly start declining. Caffeine’s half-life (the time it takes for its quantity to reach half its original value) is about eight to 10 hours, which means that if you consumed caffeine via a morning cup of coffee, you’d start feeling sleepy again by late afternoon. Could the Caffeine in Vivarin Cause Potential Side Effects? While common side effects related to too much caffeine consumption, which will vary from person to person, include nervousness, irritability, sleeplessness, and occasionally rapid heartbeat, this same article reports you'd have to take 5,000 to 10,000 mg in order to overdose, which isn't likely unless you were to take the entire box of Vivarin at once. Still, the manufacturer points out that the supplement is only for occasional use by those 12 and older, isn’t a substitute for sleep, and that you should consult with your doctor if drowsiness persists. In fact, we’d recommend speaking with your doctor any time you’re thinking about taking a new supplement, those containing caffeine or otherwise. How Much Does Vivarin Cost & Where Can You Buy? Vivarin is available from a variety of brick-and-mortar and online retailers, including Amazon, Jet.com, CVS, Walmart, Rite Aid, and Kmart, to name just a few. For a complete picture of where to buy, be sure to visit the Store Locator page on the supplement’s website. With this in mind, we found that most retailers priced one package (40 ct, 200 mg tablets) of Vivarin at about $10. However, the manufacturer also offered a $2 off coupon on their website at the time of our research. The refund policy available will depend on the specific retailer you purchase from. If you have additional questions, a Vivarin customer support representative can be reached at 855-874-0970. What Can We Learn from Customer Reviews for Vivarin’s Caffeine Pills? Vivarin has been on the market for quite some time, so we encountered a wide variety of customer feedback during our research, most of which seemed positive. For example, the supplement had a 4-star average rating on Amazon, based on nearly 120 customer reviews. There, most compliments appeared to reference ease of use, improved alertness, and no crash later in the day. The relatively few complaints often related to no results and high price. Vivarin is manufactured by Meda Consumer Healthcare, Inc., an Atlanta, GA-based company who's been in business since 2010 and makes other popular brands like Contac Cold + Flu, MidNite, and Geritol, to name just a few. Since each of these options contained the same 200 mg of caffeine per dose, and we learned earlier that there generally aren’t any meaningful differences between the caffeine quality used in these supplements, the ‘best’ option might simply come down to which one delivers the lowest per-dose cost. From this perspective, we can see that in the table above, Jet-Alert Double Strength’s $0.08 per-tablet cost might represent the most value. However, it’s important to emphasize that most national pharmacies also offer generic, no-brand alertness aids containing 200 mg of caffeine. Some we found during our research were priced as low as $4 for 80 tablets—or, about $0.05 per dose. Does this mean that you should go with Vivarin or one of these competing options? Let's wrap everything up in the next section. Outside of your body becoming used to the substance, which can lead to withdrawal symptoms like headaches, sluggishness, and irritability, the experts quoted in the WebMD article earlier indicate there aren’t a lot of known health risks associated with regular caffeine consumption, for otherwise healthy individuals. In fact, compared to drinking anything other than black coffee, taking caffeine capsules could help you avoid additional unwanted ingredients, including sugar and fat. As such, it’s not necessarily ‘bad’ for you, when used in moderation. Still, it's essential to talk with your primary care physician before beginning, who can discuss your goals and warn of potential side effects or medication interactions. With all of these details in mind, while Vivarin might not represent the lowest-priced alertness aid (in fact, they were the second highest among popular competitors in the table above), the supplement comes with a mostly positive online customer reputation, is manufactured by a company with years in business, and is sold through a variety of national retailers. Many of these could be local as well, potentially putting Vivarin in your hands faster, while also saving on S&H charges. Write a Review for Vivarin!